Figure 1. The Sun is the major source of energy and vital to life on Earth. It also acts as a flow that can be harnessed by a solar panel. Solar power is the electricity generated using the solar radiation from the Sun. Although solar power makes up a small percentage of global energy production, some countries use significant amounts of solar power. China and the United States lead the world in total solar energy capacity, whereas Germany is a country which obtains a large percentage of their electricity from solar energy. See the interactive graph below for more statistics on solar power in the world. The ability to harness sunlight and use that energy to generate electricity is achieved through a variety of methods. This article focuses on the use of photovoltaic cells and solar thermal power plants, however solar energy can also be harnessed for domestic water heating. Figures 2 and 3 below show a solar photovoltaic power plant and a solar thermal power plant. Figure 2. A photovoltaic array. Figure 3. 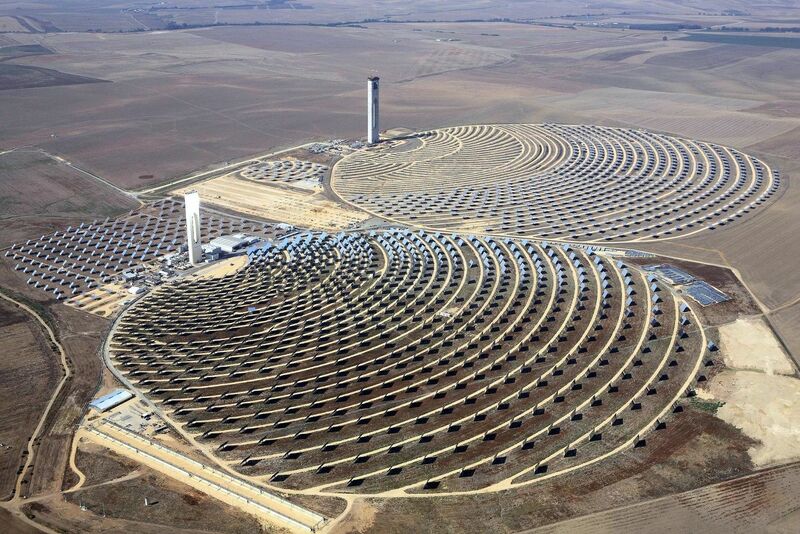 Two solar power towers at a solar thermal power plant. In order to use the energy from the Sun to generate electricity, there needs to be some method of harnessing the solar radiation. Since there is no fuel to burn to generate electricity like there is in fossil fuel power plants or nuclear power plants, different methods are used to capture or concentrate sunlight. There are two main methods: photovoltaic cells and solar thermal collectors. While solar thermal collectors are typically less complex, photovoltaic cells can be more useful as they directly transform solar radiation into electricity. See the interactive graph below for more statistics on solar power in the world. Figure 4. A solar panel, consisting of many photovoltaic cells. Photovoltaic cells make use of a semiconducting material that, when struck by sunlight, generates a small current as a result of the photovoltaic effect. Unlike some power plants that require steam, solar power using photovoltaic cells is created directly by transforming energy from the Sun into electricity. The vast majority of photovoltaic cells are composed of silicon semiconductors, and interact with incoming photons in order to generate an electric current. These cells can be placed in a solar panel and oriented to face the Sun. For residential use, panels can be placed on the roof to generate electricity for the home. For utility scale electricity generation on solar farms, large numbers of these panels are arranged in an array (shown in Figure 2) to collect significant amounts of electricity. For more information on the different types of photovoltaic cells, click here. Figure 5. A parabolic solar collector. While photovolatic cells convert the Sun's energy directly into electricity, this is not the case with solar thermal power. Solar thermal power plants are electricity generation plants that utilize energy from the Sun to heat a fluid to a high temperature. This fluid then transfers its heat to water, which then becomes superheated steam. This steam is then used to turn turbines in a power plant, and this mechanical energy is converted into electricity by a generator. This type of generation is essentially the same as electricity generation that uses fossil fuels, but instead heats steam using sunlight instead of combustion of fossil fuels. These systems use solar collectors to concentrate the Sun's rays on one point to achieve appropriately high temperatures. The line graph below shows rapid growth in consumption of solar energy in different regions worldwide. Another useful view is to select "bar" and "country", to see the major solar power users worldwide. Once here, clicking the "per capita" button will show the solar power per person.